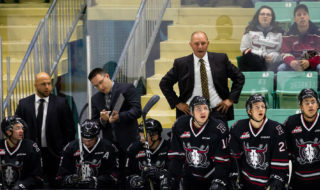 Red Deer Rebels GM/head coach Brent Sutter reflected on his club’s 2017-18 WHL season (as per the audio clip posted on this website) while meeting with the local media Monday. One day later, he looked ahead to the 2018-19 season and touched on his potential lineup and what he will expect from each and every player. First off, the club will be young — once again — up front, with, barring an off-season trade, no 19-year-old forwards on the roster and possibly only one 20-year-old in Reese Johnson. With overagers Mason McCarty and Grayson Pawlenchuk moving on and the possibility of losing Brandon Hagel and Kristian Reichel to the pro ranks, the Rebels could head into next season minus a boatload of offence. 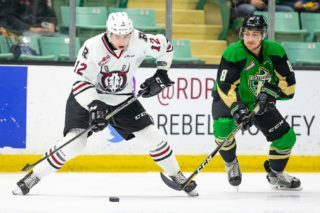 As a result, the Rebels will need more from the likes of Chris Douglas, Brandon Cutler, Austin Schellenberg and Josh Tarzwell, all of whom turn 18 this year. 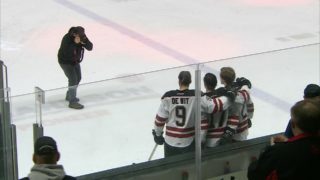 “They’re going to be bigger players and stronger players next season,” said Sutter, who’s counting on the cycle of major junior hockey to pay off for his team. “It’s just the way it is in junior hockey. When you’re a year older you’re usually stronger and more confident. Based on the recently concluded Rebels season, the team appears to have some promising forwards in Arshdeep Bains, River Fahey, Zak Smith, Alex Morozoff and Justin Svenson, all of whom will celebrate their 17th birthday this year. “But everyone still has to earn their place. There’s nothing guaranteed to any of these guys coming in,” said Sutter. “They’ll have to earn a spot on the team. They’ll have to come in and earn their roles . . . where they’re going to fit in. The return of Reichel and/or Hagel would be huge. Both would be among the best overage players in the league, but Hagel could still sign with the Buffalo Sabres, who drafted him two years ago, or go back into the draft and sign a pro contract with another team, while Reichel is expected to be drafted in June and would prefer to play for pay next season. “We don’t know what’s going to happen with Hages and Reichs,” said Sutter. “Reichs wants to play pro in North American or Europe, but you still have to be good enough to play at that level. As for Hagel . . .
Ethan Rowland and Jordan Borysiuk, both with 2002 birth dates, were brought in this winter after their midget AAA seasons ended, and will compete for regular employment next fall. But neither will be rushed. “They’re signed players and each of them got into a game or two here. Now they have to come in next season and push, and yet they’re only going to be here if they’re ready to be here,” said Sutter. The same situation exists with Kyler Kovich, who will be 16 this year but has yet to sign with the Rebels, and 17-year-olds Jayden McCarthy and Blake Sydlowski, a listed player. The back end will be more experienced with Dawson Barteaux, Jacob Herauf, Alex Alexeyev, Carson Sass and Ethan Sakowich forming the blueline core. 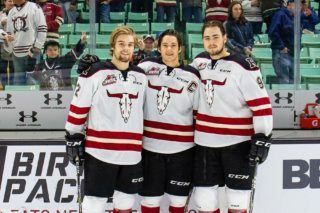 Other potential returnees are Hunter Donohoe and Sam Pouliot, both 18 this year, along with Colin Paradis, who could be back as a 20-year-old. Potential rookies next season are six-foot-three Nick Draffin and six-foot-five Ryan Gottfried, who played at the midget AAA level as 16-year-olds. “They’re both big guys, but it will depend on their skating,” said Sutter. “Donohoe and Pouliot and those two will be fighting for two or three spots. “Overall, there are six or seven young guys who are going to be fighting for spots. It will come down to who fits in and is most comfortable playing at this level . . . who’s ready and who’s not. 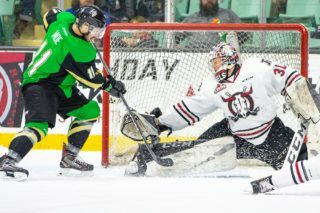 Sutter is confident that netminder Byron Fancy, who turned 17 on Jan. 1 and is currently with the Alberta midget AAA champion Lethbridge Hurricanes, is ready to perform at the major junior level. Accordingly, it’s expected that he’ll enter the ’08-19 campaign as the back-up to Ethan Anders, who is coming off an impressive rookie season and won’t celebrate his 18th birthday until late September. An Anders/Fancy combo would leave two-year veteran Riley Lamb, who turns 20 in August, as the odd man out between the pipes. “I talked to Lamber and went through everything with him at the exit meetings,” said Sutter. “Obviously he still wants to play in the league and it’s not that he’s not a good enough goalie, it’s just that where we’re at with our team it doesn’t make sense to have a 20-year-old goalie here. Much will be expected of Anders, who posted a 3.09 goals-against average and .905 save percentage in his first WHL season. The team will head into the ’18-19 season minus 108 goals if Reichel and Hagel join McCarty and Pawlenchuk as former Rebels. Clearly, the returnees — both forwards and blueliners — will have to pick up the offensive slack, but Sutter, who will attempt to select an impact forward in June’s CHL import draft, doesn’t want any of the players coming back with unrealistic expectations. “They have to be careful how they manage that,” said the Rebels boss. “If they feel they should be playing top-six forward or top-four defencemen roles, or maybe on the first power play unit, then they’ll train like that. “Instead, they should come in and be real hard guys to play against. If they compete and play harder, make sure their details and good and that they’re playing the right way, their offence will look after itself. Sutter was speaking from recent experience. Sutter met with all the potential returning players Monday and had a common message for his troops. “We were clear to everyone in the exit meetings what type of players they are and how they have to continue to grow and develop, what kind of training they have to do during the summer,” he said.